(Phys.org) —Harvesting waste heat from power stations and even vehicle exhaust pipes could soon provide a valuable supply of electricity. A small team of Monash University researchers working under the Australian Research Council (ARC) Centre of Excellence for Electromaterials Science (ACES) has developed an ionic liquid-based thermocell. Thermocell technology is based on harnessing the thermal energy from the difference in temperature between two surfaces and converting that energy into electricity. "We have found that it can work at elevated temperatures typical of important heat sources, as opposed to water-based systems, which cannot operate at temperatures above 100 degrees Celsius," Professor MacFarlane said. "The device offers the possibility of a cheap and flexible design suitable for harvesting waste heat in the 100- to 200-degrees Celsius range." "The major benefit of a thermocell is that it harnesses energy that is already readily out there; you're just harnessing energy that is otherwise lost to surroundings," Mr Abraham said. 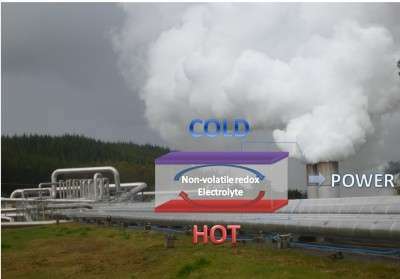 "The advance we made with this system was that we are generating more electrical energy than any previous power cell in this temperature range," Dr Pringle said. "Our unique research environment within ACES provides an opportunity to acquire these skills in a cutting edge research environment," Dr Wallace said. Mr Abraham's research is published in the journal Energy and Environmental Science. You misspelled carbon-neutral in the image caption.